No glass cases. No galleries with their white walls and red dots. 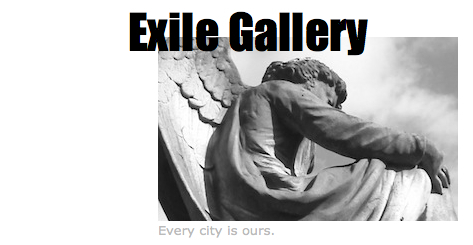 Just art in EXILE primarily showcasing work by and inspired by B-Ville 2049. Neo-minimalist in style, B-Ville 2049 is cousin to the Dadaist movement of the 1920's which sneered at the deadly logics of bourgeois nationalism that they believed led to the atrocities of war. B-Ville 2049 pushes their ideas to the limit, rejecting even irony, and the nature of the media themselves. Videos refuse to move. Words persist in remaining abbreviations. Sentences refuse to extend beyond the phrase. Sound is restrained, ambient and restricted to short bursts. Color is equally muted. We welcome related art that will encourage the attentive audience to pass from a consideration of each work to a meditation on the very nature of silence, refusal and revolt.